Look, it’s Everton again! Saturday, Everton! Tuesday, Everton! Sunday, Everton! Halcyon days, these. And our boss reckons the heights we reach could get even loftier. The spell of five minutes in which we dealt with Swansea was very pleasing to all watching (except Garry Monk). Lukaku and Barkley didn’t have the hardest finishes, but they were in the right place to dispatch. And a goal from a corner! What mad world are we living in, eh? It’s that sort of form that will keep us winning games and picking up points – 27 left if you weren’t counting. Form is hardly the Everton player’s bosom buddy. But Aiden McGeady continued on from his late cameo against Cardiff and showed a lot of quality against Swansea. He’s Everton all over, him. Cheap and cheerful. He’s cheap, we’re cheerful. Kevin Mirallas was again frustrating, but got two assists. In fact, he’s leading the way for us when it comes to laying on goals. 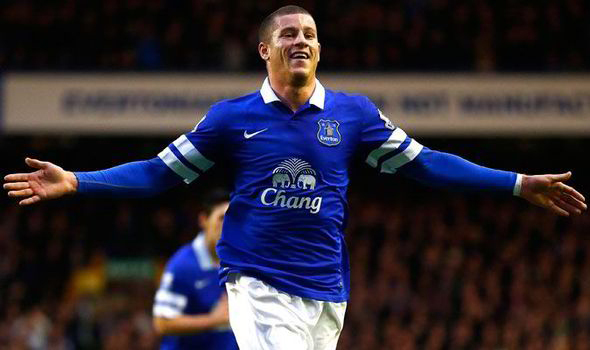 We’d love a Kevin Mirallas who does the business week in, week out, but this is our X-Factor player. I don’t mean the TV show – he gets judged by a fair few more than four idiots every weekend. While McGeady puts in a shift, Mirallas makes a difference at key moments. Not a bad combination, that. It’s not all sunshine and flowers, of course. Conceding two goals and letting a team with Jonjo Shelvey featuring in it dictate play is not a vintage performance. But three points are exactly what we wanted, and it’s what we got. Look at that too. Eight straight home wins. Home form in the last six games is the third best in the top European leagues. Ace at Goodison, aren’t we? Great time for back to back away games then eh? Yippee. First up is a trip to see the Barcodes in Chez Pardew. Except Alan Pardew is still as welcome in a football ground as Purple Aki is at the Mr Universe contest, so John Carver will be in the home dugout. Hey, everyone. Remember when Alan Pardew said we were in different leagues? Remember that? Course you do. Two years on and the scrote is still serving a ban for being a scrote while his club look up longingly at the places they flirted with briefly before plummeting. Newcastle serve as a good warning to us, as do Swansea. The European distraction will affect you – if you mismanage the situation. Pardew actually had money – real, useful money – to spend, and didn’t. One injury crisis later and he’s making headlines for being a bad loser rather than a bad winner. On the pitch, they’ve got more drama than Coronation Street. Better acting, too. They’ve got a real penchant for nicking late goals, with the likes of Ben Arfa and Sissoko creating a lot from midfield. Wake up Gareth Barry, we’ll need you for this. But as much as they steal victory from the jaws of defeat, Newcastle also manage to do it the other way round. They’ve drawn just four games this season – so any clinical opponent can deal with them. Clinical, eh? This could be tough. Make no bones about it – they’ve beaten Chelsea and drawn with that supposedly invincible red lot at St James’ Park. Trouble is, since then they’ve been battered by Sunderland and slipped up against Cardiff in the FA Cup. They’ve also struggled for home goals in recent weeks. This is no fortress. It’s still a good side facing us – Krul in goal is ace, although prone to bouts of madness (as all keepers are, of course). The defence at the moment is Dummett, Yanga-Mbiwa, Coloccini and Williamson, which is hardly the stuff of nightmares. Remembering the way Barkley and Lukaku sliced through them also brings back a warm, optimistic feeling. It’s a Beauty and the Beast situation in midfield, with Sissoko alongside that madman Chieck Tiote. Anita or Ben Arfa could join them – the latter is a lot more of a threat. Without Yohan Cabaye, there isn’t too much of an attacking threat. Being the connoisseur I’ll pretend I am, I’ve watched Yoan Gouffran closely and have been very impressed. He has the tireless work rate and creative ability that makes him a real threat, which Newcastle need as de Jong and Cisse are as reliable as a Crimean referendum. Remy and Debuchy miss out, which is a bit of a boost. Fun fact – the fastest player on the pitch (highest speed reached) on Saturday wasn’t Mirallas or McGeady. It was John Stones. That’s just another reminder of his class. So if Roberto Martinez decides against using Phil Jagielka, which he probably won’t as he was described ominously as “medically fully fit” – just medically? – there’s no issue in the defence. It’ll probably be a front line of McGeady, Barkley and Mirallas behind Lukaku, which no-one will be complaining about. Roberto Martinez reckons that 71 points could secure 4th place and a return to the Champions League. So for our last 9 games we’d need 5 wins and 2 draws. Do-able? Yes, probably. Beating four sides to that total? Perhaps not. But it’s worth a go. That means games like this must be treated with a bit more grandeur than necessary. Cup final, this. A must-win. It’s not of course, but as we approach the sprint stage of this Tour de Premier League, a win against strong opposition would certainly help us make our way to the front of the pack. Let’s have it Everton.